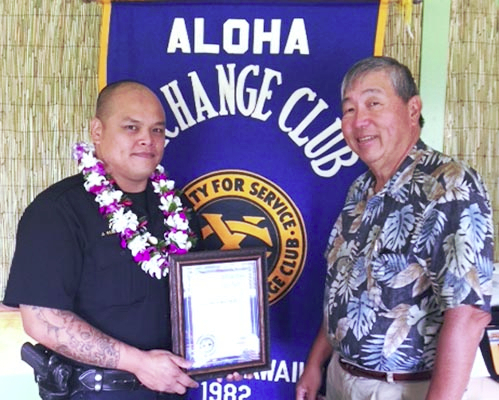 Aloha Exchange Club Director Curtis Chong presents an 'Officer of the Month' certificate to Officer Jeremy Kubojiri. Kubojiri, a South Hilo patrol officer, was honored Thursday (December 19) for apprehending a repeat offender and convicted felon wanted for crimes of violence and, four nights later, stopping multiple thefts and an attempted arson in progress. On November 4, Officer Kubojiri spotted a speeding truck that pulled off to the side of the road. When Kubojiri approached, the driver began acting suspiciously and a glass pipe was observed in the truck. Kubojiri determined that the driver was unlicensed, uninsured and wanted for felony assault and abuse by choking. A search of the vehicle led to the discovery of crystal methamphetamine and marijuana, among other drugs. The driver was charged with three felony drug offenses, felony assault, felony abuse, driving with a revoked license and driving without insurance. Four nights later, Kubojiri was patrolling downtown when he spotted a man with a moped and a bicycle who was throwing a burning object onto the roof of a garage. Police extinguished the fiery object, and determined that the moped and bicycle belong to the garage owner. Kubojiri arrested the suspect, who was later charged with five offenses, including felony theft and arson. In June, Kubojiri was named “Officer of the Year” for his performance of a special assignment as South Hilo Patrol’s drunk driving enforcement officer.